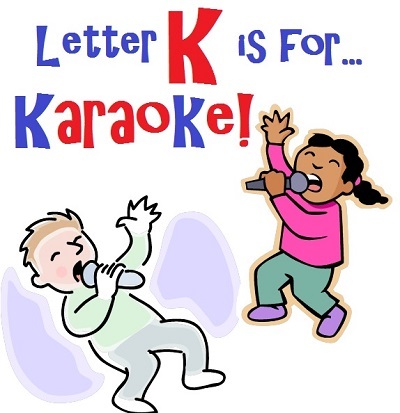 “Letter K is for Karaoke Week” is next! Happy New Year! The students returned to school for the first time since the arrival of 2014. Not even a polar vortex responsible for record-breaking low temperatures throughout the entire country could stop the PPA students from making “Letter J is for Jobs Week” a tremendous success! “Letter J is for Jobs Week” was joyful, jubilant, jovial and just jazzy! 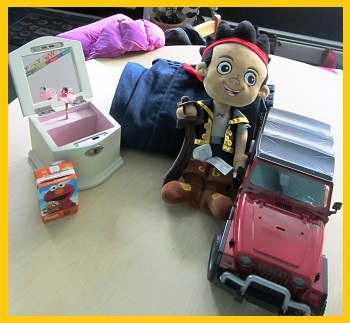 The students shared such a wonderful assortment of letter J shares; can you identify the J share items shown below? 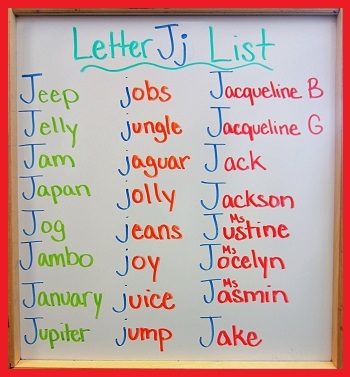 Wednesday began the artistic exploration of the theme of Letter J week – Jobs! Speaking of artistic, the students spent the morning discussing and learning about various jobs in the arts! To begin the discussion, the students were asked the following question, “What is an artist?” The students’ hands flew up into the air and answers such as, “Someone who paints” or “Someone who draws things” were mentioned. The teachers assured the students that they were absolutely correct, painters and people who draw are certainly artists but what about people who write the books that we read? What about the people who sing songs that we listen to on the radio? Are they artists? The children seemed a bit confused by the question until the teachers explained that anything that you create using your mind and imagination can be considered art. 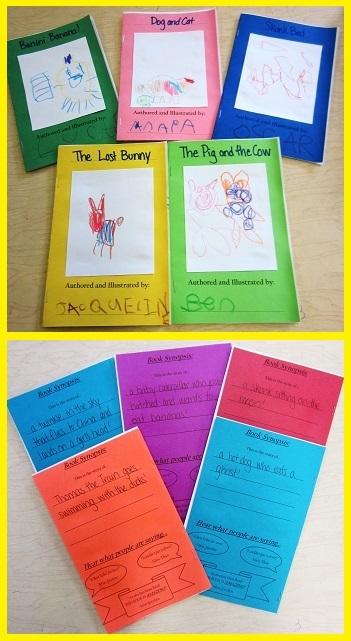 To emphasize this point, the teachers utilized a book from beloved childhood author and illustrator, Todd Parr. Known for his colorful, creative and childlike drawings, Todd Parr often chooses interesting colors for his illustrations. 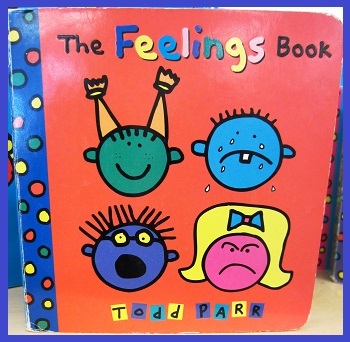 Take a look below at the cover of one of Todd Parr’s books – The Feelings Book. Have you ever seen a person with a green face? How about a person with a blue, purple, or pink face? The students all were in agreement that they had never seen anyone with a face like any of those. The teachers asked, “Well, why would Todd Parr make the people this way? 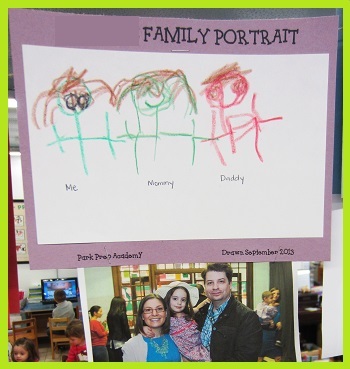 Is he wrong?” The students laughed and were quick to say that, “He just wanted them like that and that is okay!” The teachers then drew the students’ attention to their own family portrait drawings that are on display in the classroom. Believe it or not, many of the PPA students chose creative colors to create their drawings, just like Todd Parr! Take a look at this student’s green self, green Mommy, and red Daddy. Just like Todd Parr and other artists, this student used her imagination to create her drawing. What a beautiful piece of art she created! During the afternoon on Wednesday (and Thursday), the students were introduced to a new unit in Spanish class – la comida (food). The students learned vocabulary for four different types of food – leche (milk), jugo (juice), queso (cheese) and papa (potato). They also learned La Cancion de la Comida (The Food Song). Be sure to practice this with your child over the next few weeks. Queso is cheese, yum, yum, yum! Leche is milk, yum, yum, yum! These are the things we like to eat and drink. The students were thoroughly enjoying learning the new vocabulary but it was clear one word in particular was their favorite. As soon as Miss Jasmin stated that potato in Spanish was called papa, the classroom erupted in laughter! The students were laughing so hard at the thought of a Daddy potato. No surprise, the students seemed to remember the Spanish word for potato with great ease. The arrival of Thursday marked a new day and a new profession or type of Job to investigate. This time, the students would be learning about and discussing the people whose job it is to build and fix things! Whether building something small like a cabinet or something large like a bridge, builders play an extremely important part in all of our lives! One thing is for sure, builders rely on their minds and their tools to get the job done! The students were asked to identify as many building tools as they could. Suggestions like hammer, screwdriver, drill, and saw were shared and then the teachers asked the following question, “What do you think people who build big tall buildings use? Do they use hammers and other tools that fit in a hand?” To many of the students’ delight, a long list of construction machinery including cranes, wrecking balls, bulldozers, diggers, and more were added to the list! With all this talk about building, it made perfect sense that many of the morning stations would include building elements and of course the Fix-It Shop was a highlight! For their morning work, the students created their very own builder’s tool belt complete with a few essential tools! Take a look below to see the students in action! After investigating various jobs throughout the week, the students were called to the morning work tables and interviewed for their thoughts about their parents’ occupations on Friday. The students’ words were recorded by the teachers and boy, were they funny! While some students were able to describe the exact job their parents have in great detail, others embellished a bit. Whether their answers were on point or had missed the target a bit, they made for a big smile from their parents at pickup time. Here are some of the students answers about Daddy’s Job. Here are some responses about Mommy’s work. After pondering about their parents’ jobs, the students chose what they would like their future job to be. Here are some of their answers. Friday afternoon wrapped up with a technology presentation all about – you guessed it – JOBS! The teachers found some great (and classic) clips from the Sesame Street segment called, “People in the Neighborhood”. The rhythmic and catchy tune of the clip made it a real hit with the students! Take a listen in below to meet a few people whose job it is to help make our neighborhood so great! Enjoy! Well, that is all for “Letter J is for Jobs Week” at PPA! As we said, it was just joyful! 🙂 As always, thank you for reading. Have a fun and safe weekend!